To be clear, we’re talking about outsourcing everything, from ordering and provisioning devices to canceling contracts and recycling devices when employees leave, plus all the configuration and support that happens in the middle. The numbers were actually pretty surprising, since nearly everyone considers mobility a competitive advantage. Of all the survey respondents, 17.2 percent are already using an MMS provider, 31.5 percent are actively investigating them, and just 13.6 percent of would never outsource. How can you outsource a competitive advantage? I made a few phone calls, and the answer is, “because everyone else is doing it wrong.” Enterprise mobility is an absolute mess, so mere competence can put you ahead of the pack. The CIO of a small payment processing company explained, “I’m an Ops guy, but mobile Ops are completely different from keeping servers up and running. If it were just app support, we could probably handle it, but I don’t know anything about negotiating rate plans or employee chargebacks, and honestly, I don’t want to.” He doesn’t yet know whether his new MMS provider is actually saving the company money because he had no idea what his company was spending in the past. However, with the provider’s help, the company is starting to set policy and get visibility into their total spend and the way its employees actually use devices and plans. He can now monitor costs, support incidents, and on-hand stock through a single interface, and Finance has a total picture of its cost-per-employee. Outsourcing mobility is getting easier as vendors move security off the table. The most underrated announcement at this year’s Google I/O was Android for Work. By bundling Samsung Knox and technology from its Divide acquisition into Android, Google is making vanilla Android safe enough to go to-to-toe with iOS in the enterprise. Microsoft’s announcement that it would bundle common mobile-application management features like DLP into mobile versions of Office apps did the same thing: It made the status quo “safe enough” so so that ops could get on with operations and stop worrying about locking things down. If you’re an app developer or involved in truly cloak-and-dagger stealth operations, you’ll probably still need to manage things in-house, but if you just need to get Office running on your phones, someone else can probably do it better for less. MMS providers also have a lot of solid strategic advice. If you’ve spent the past few years worried about securing email on employee-owned phones, you probably haven’t had time to think about where you want mobility to take you. Another MMS client explained that her provider walked her through a process of “pairing big-picture goals to very specific, tactical things, like tiering support levels and hardware policies to different roles.” The company has now scaled back the strategic portion of its contract to semi-annual “check-ins” at which they “tune up” processes and brainstorm new directions. MMS providers will always have insights brought about by sheer scale, and unless you’re pushing the envelope, they probably know more than you. With all that said, not all MMS providers are equal. There are plenty of fly-by-nights that will try to sell you the moon, and the best providers have all specialized to one degree or another. 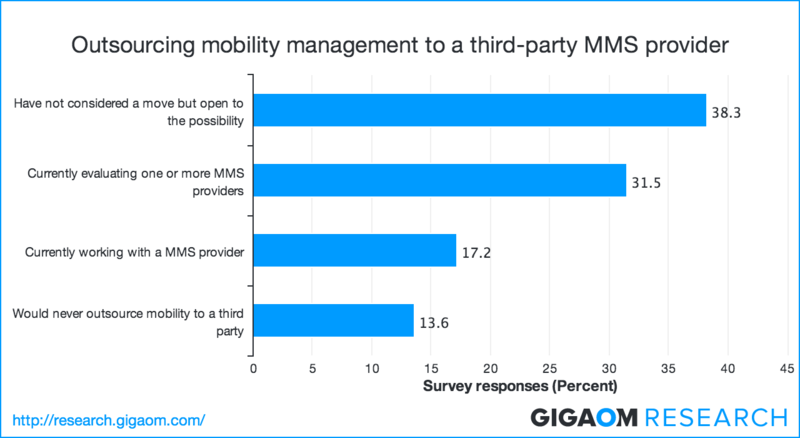 Mobility is essential, and choosing the right MMS provider is every bit as important as finding a hosting provider or payroll system. We’ve outlined the process and evaluated five representative vendors in our Managed Mobility Services Sector RoadMap. That’s probably a good place to start. Cormac Foster is a Research Director at Gigaom Research covering Mobile Technologies and Enterprise Operations. He has spent nearly 20 years in enterprise technology as a QA manager, product manager, industry analyst, and writer.